Baan Kinara Villa is located in a prime holiday location on a popular gated residential estate that is just over 1km to Jomtien Beach and even closer to Western-style restaurants and shops. Under a 5-minute drive to the main strip in Jomtien and just 2-minute to the beach, this villa is ideally situated for a family, a group of friends or even a couple. This modern tropical villa comes equipped with 3 spacious bedrooms that sleep up to 6 people. You will immediately see a spacious garden area that has a large private swimming pool with a surrounding terrace and sun-loungers. There is also an outdoor terrace that is the ideal spot to relax at poolside with a meal in the evenings, which leads into the main part of the house. Once inside the main living areas, you will encounter an open-plan arrangement with a lounge and dining area, all very neat, clean and tidy. The lounge comes equipped with a comfortable sofa suite and large flat-screen TV with international channels and a sound system, within close proximity to a dining space with a 6-seat table. There is also a Western kitchen with lots of modern appliances. The 3-bedrooms all enjoy a modern appearance and come with double beds, wardrobes, televisions and access to ensuite bathrooms. 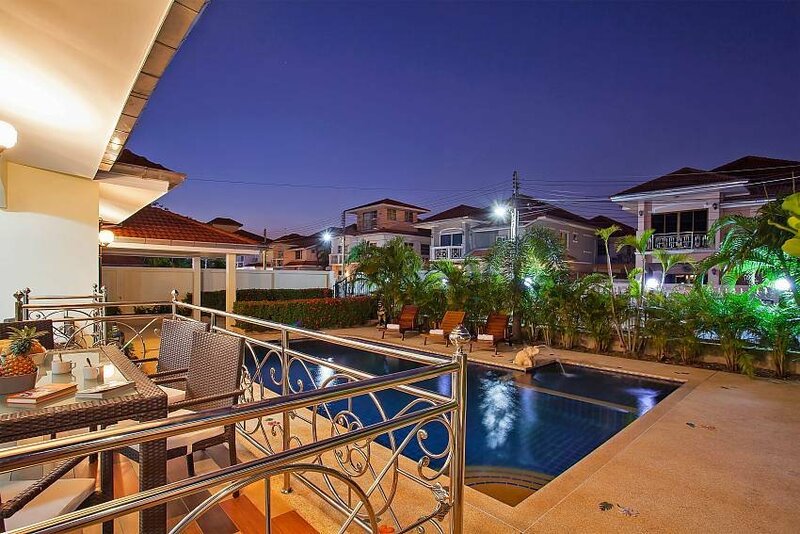 Just a 2-minute drive to the beach and a 5-minute drive to Pattaya Floating Market and Underwater World Pattaya, this villa is conveniently located in a prime holiday position.